With the advent of the Internet and the limitless information it contains, we are less sure about what we know, who knows what, or even what it means to know at all. And yet, human knowledge has grown in previously unimaginable ways in inconceivable directions. In Too Big to Know. David Weinberger explains that the Internet era represents a fundamental change in the methods we adopt to understand the world around us and enables people to make smarter decisions than when forced to rely on traditional sources of expertise. We can now be as smart as our new network medium allows - but we will be smart differently. 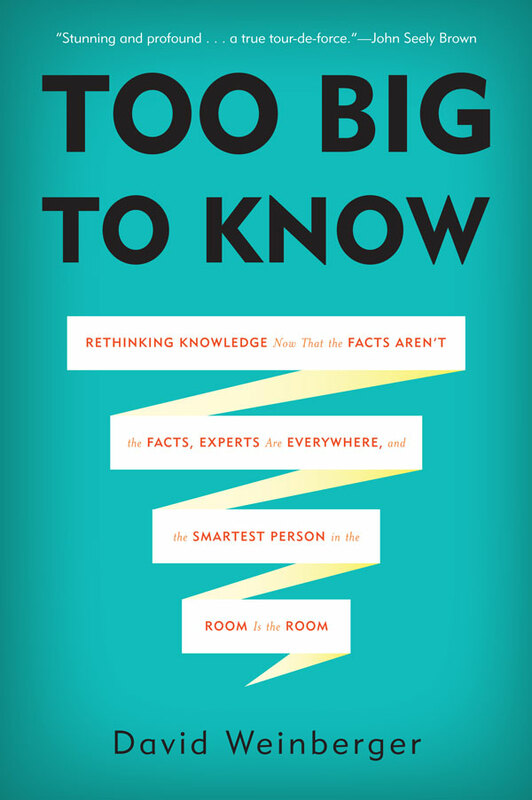 Drawing on examples from history, politics, business, philosophy, and science, Too Big to Know describes how the very foundations of knowledge have been overturned, and what the revolution means for our future. "Mr. Weinberger's book will likely make a splash and be widely discussed, as it deserves to be. "— Quentin Hardy, New York Times. "[W]hat Weinberger has done in a relatively short, admirably readable book is take on a complex, shifting, destablized, and boundary-free set of ideas and talk about them in a way that makes them connect in a way that gives them coherent shape. "— Inside Higher Ed. David Weinberger, Ph.D., writes about the effect of the Internet on ideas. He is a co-author of the bestseller, "The Cluetrain Manifesto" (2000) and is the author of "Small Pieces Loosely Joined" (2002) and "Everything Is Miscellaneous" (2007). His work has appeared in everything from Wired, Scientific American and Harvard Business Review to TV Guide. Dr. Weinberger is a senior researcher at Harvard's Berkman Center for Internet & Society, was co-director of the Harvard Library Innovation Lab, and recently was a fellow at the Harvard Shorenstein Center. He has been a marketing adviser to many high tech companies, and adviser to several presidential campaigns, and was for two years a Franklin Fellow at the U.S. State Department. Dr. Weinberger has given hundreds of keynote presentations around the world to audiences in the fields of business, government, education, and more. His talks are acclaimed for their freshness, insight, and humor. Dr. Weinberger has a Ph.D. in philosophy from the University of Toronto, and lives in Boston. Buy the book at Amazon, support your local bookstore, and don't forget your local library!